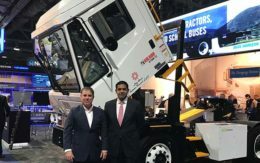 Electric truck manufacturer Workhorse Group and commercial vehicle supplier Dana Inc. unveiled a Class 5 van powered by a jointly-built electric axle. The companies made the announcement at the ACT Expo green transport conference in Long Beach, Calif., Tuesday. The fully electric vehicle is a combination of the chassis and battery pack from a Workhorse E-Gen van, the body of a Morgan Olson UPS delivery truck and the new Dana axle. The truck has a gross axle rating of 13,500 pounds and a gross vehicle weight rating of 19,500 pounds. It can travel up to 67 mph on the highway. The concept vehicle is not slated for production. 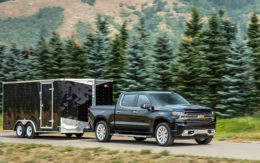 However, interest from potential customers could bring it to market, said Duane Hughes, president of Workhorse. 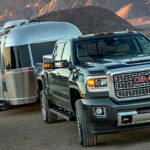 The axle itself could be made ready for production if desired, said Steve Slesinski, director of product planning at Dana. Workhorse and Dana developed the new axle in tandem, through the supplier’s Spicer Electrified brand. Spicer produces electric axles called e-Drive for smaller commercial vehicles. The new axle, called the e-Drive eS9000r, is the largest application of the technology. It is a 400-volt system designed for Class 4, 5 and 6 vans, trucks and buses. “The integrated e-Drive axle solution leverages proven competencies that will enhance the Workhorse electric vehicle architecture to deliver maximum efficiency at a reduced system weight,” said Mark Wallace, executive vice president of Dana. The eS9000r is made of an integrated motor, transmission and axle power system. All components are housed in the center section, between the two hubs that drive the vehicle’s wheels. This packaging allows the eS9000r to save 388 pounds compared with a conventional electric axle linked to an external motor, according to Dana. The sole purpose of the internal motor is to generate power to charge the batteries, fitted into the truck’s frame rails, when they run low. Spicer engineered the motor to turn in the same direction as the wheels in order to reduce efficiency loss. The result is 220 kilowatts of peak power and 700 newton meters of torque. The figures are the equivalent of approximately 295 horsepower and 516 pound-feet of torque. The new e-Drive axle improves the efficiency of the E-Gen van by at least 14 percent, Hughes said. That creates opportunity for the new axle to reduce the vehicle’s total cost of ownership. 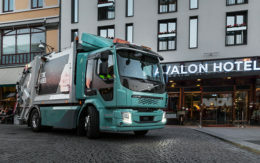 When fitted with the eS9000r axle the truck contains 60 kilowatt-hours of energy, or about twice that used by the average U.S. home each day, he said. If the vehicle is more efficient then it requires less investment in infrastructure and electric power during charging. “Over the gasoline equivalent, this vehicle over 20 years will cost $200,000 less,” Hughes said. Both Workhorse and Dana expressed a desire to work together on future products. “We’d certainly like to have further collaboration,” Slesinski said. Great to see workhorse finally prioritizing efficiency. I like it exchanging knowledge ideas combining technology to make things work in harmony. Nice piece of work. Should find many good applications!